Rare Spyder! Carbon Fiber Sport Seats! Only 4k Miles from new! Luxury Motorcars is pleased to present this very rare 2016 Boxster Spyder. 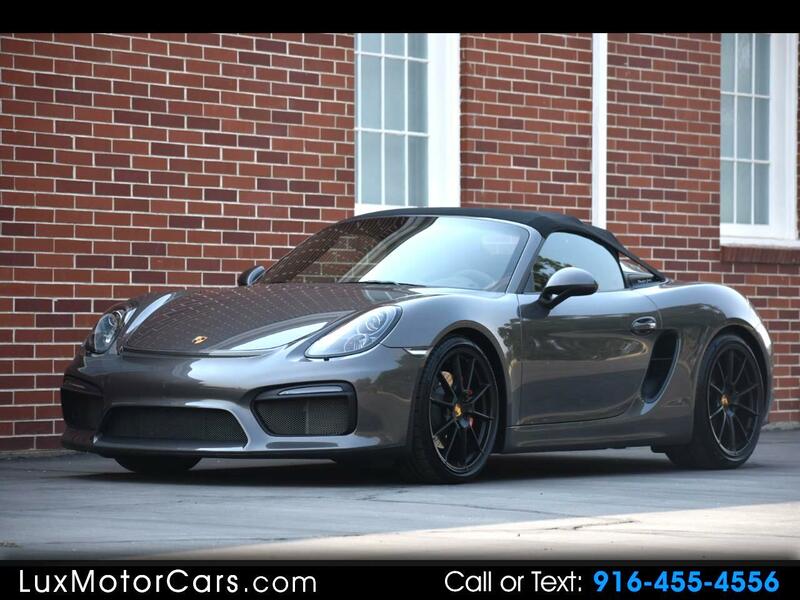 This car has under 4,000 miles since new and has been extremely well equipped from the factory with options including Agate Grey Metallic paint, full bucket seats, Bi-Xenon headlights including PDLS in black, light design package, infotainment package with Bose surround sound system, Boxster Spyder wheels painted in satin black, seat belts in Guards Red, tinted tail lights with clear center element, Ornamental Porsche crest, Pedals and footrests in aluminum, mobile phone preparation, wind deflector, fire extinguisher, 64-liter fuel tank and more! There is no argument that this is the perfect color combination for the car and when the tops down the Alcantara racing buckets with guards red seat belts and lightweight red door pulls look spectacular. The red brake calipers set it off with just the right amount of color to the exterior. Porsche (finally) uses the 3.8-liter engine from the Carrera S in a mid-engine platform and the results are nothing less than breathtaking. The extra power combined with massive weight savings creates what I’d describe as one of the best driving experiences I’ve been lucky enough to enjoy. Collectors have been speculating that these cars are so special they might increase in value sometime in the near future. Even if they don’t begin to appreciate that will almost certainly hold their value as good as anything out there. Message: Thought you might be interested in this 2016 Porsche Boxster.